Ramdhan Dhikr Chart has a list of Dhikr which is full of Rewards and is recommended to be read at all times . Do feel free to Download this 34 Page Ramadan Dhikr Chart . In this Chart you will find 30 days of list of recommended dhikr . 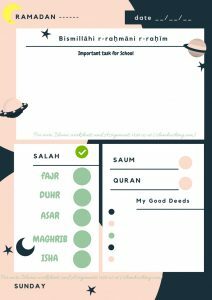 There are check box behind every dhikr so that you can track the amount of Dhikr you did in Ramadan . It Also includes Salah Planner and Quran Planner . This can be Very useful if you want to increase your amount of Dhikr and be consistent in it . You can Download it FREE and distribute it to anyone with the condition that you do not modify the pdf . You can Blog it in your Website by giving due credit to our website and without altering or modifying its content . This is a humble request ,Please Keep me and my Parents in your Dua and do lots of Dhikr in Ramadan . Alhamdu liLahi wa liLahil hamdu. Thank you and Allah bless abundantly without measure . The calligraphic presentation is good . It will benefit a wider scope of willing and deserving believers if you add a column or simply transliterate below the Arabic . Thank you for sharing this all. This helps a lot.